Water Striders Archives - What's That Bug? Currently viewing the category: "Water Striders"
what’s a common water strider in China? To be specific, Hebei Province. Is it the genus Gerris? These are Water Striders in the family Gerridae, and according to BugGuide, they are found on the: “surface of ponds and slow-moving streams/rivers.” Your individuals appear to be immature nymphs. 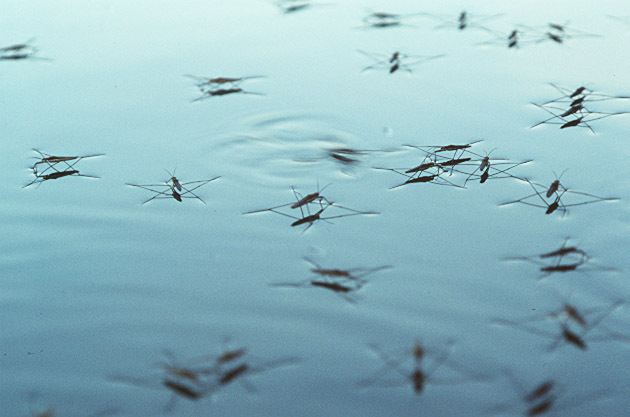 Water Striders feed on small insects that fall onto the surface of the water. Thank you so much for ID-ing those crazy bugs! The mystery is solved! Water Strider nymphs! I never would have figured that out on my own! Thank you so much for your help! We just received a comment from Paula indicating these might be Smaller Water Striders in the family Veliidae, also known as Riffle Bugs according to BugGuide, and we agree that her correction is probably accurate. I found these water striders in a quiet part of a small stream going into the Potomac River in Riverbend Park, Virginia. They are clasping each other, but isn’t it a bit early for mating? If you can identify the species that would be great, too. Thank you for your wonderful site. Thanks for sending in your wonderful image of a Water Strider, an aquatic insect that is able to disperse its weight so that it can skate across the surface of the water without breaking the tension. Thanks so much for forwarding what appears to be a mating or courtship image of a pair of Water Striders. This is a Water Strider in the family Gerridae, a group of insects that are also known as “Pond Skaters, Jesus Bugs, Water Skippers” according to BugGuide, a North American insect website. Water Striders skim across ponds and other bodies of water on long legs that distribute the insect’s weight so as not to break the tension of the surface of the water. Water Striders prey on insects that fall into the water. Here is an image from the Insects of Thailand site. We suspect your individual is immature as it does not have fully developed wings, but we cannot say for certain as we believe some species of Water Striders are wingless. I’ve got a bit of a problem in my pool at the moment. I’ve more or less always had these strange 4 legged creatures in my pool, but no more than a dozen or so usually. Stays consistently on the surface of the water (minuscus). EXTREMELY fast moving across the surface of the water. Mostly avoids humans. If I walk along the edges of the pool they usually see me and move away. Very difficult to catch, tried with a pool net, one, they’re fast, two, when I actually catch them, they jump out of the net. The adults I suppose, are no longer than an inch in length. I’ve decided to post this because as I said, usually I’d see a dozen or two of them. Today I went to my pool and I kid you not, I must have seen about 500 to 1000 baby versions of these critters in there. The babies are no bigger than the nail on my pinky finger, and even smaller actually. I’d to know what they are. So I can do a bit more reading on them, figure out why they’re in my pool, and find a way to remove them. And I’ve used you’re site successfully before to identify other weird things in my house. The closest I found while googling was a water scorpion, but if you look at my pictures attached, you will see that these things don’t have any tail of any sort. Information about Durban. Warm, moderately humid. Summers are 30 to 35 degrees Celsius. Winters are 10 to 20 degrees Celsius. In summer we do have alotta thunderstorms. Winters are largely dry. Looking forward for some assistance on the matter. PS I do photography as a hobby and it pains me that my SLR was dead today so I had to use my cell phone camera instead. I think the photo quality is still good enough for you to inspect the salient characteristics of the bugs. Thanks for your thorough account. These are Water Striders in the family Gerridae, and according to BugGuide, they are also called “Pond Skaters, Jesus Bugs, Water Skippers.” They feed on insects that fall onto the surface of the water. If you get your SLR repaired, we would love better photos. I read your comment about wishing you had more photographs of water striders. I attached a few shots that I took several weeks ago at Tucquan Glen in Lancaster County PA. There are two shots of an adult with prey and a group of young individuals. They were not easy to photograph due to their constant motion. Alas, we haven’t the necessary skills to distinguish one species from another or even to definitively determine the correct genus, so our identification might be incorrect. Your photos which illustrate the feeding habits are a marvelous addition to our archive.